Following the tragic events in Manchester, Paris, Brussels, and Nice public opinion should be informed as to who is behind the Islamic State. The War on Terror only started after the events of 9/11 and it is a fake war on terror. I will state again just a part of what Nick Rockefeller said to Aaron Russo in the year 2000. “They would then be a fake ‘war on terror’ which would have people looking in caves in Afghanistan for Bin Laden. The fake war on terror will never end and will enable us to take away peoples freedoms”. This is backed up by what Robin Cook said about Al Qaeda. In early 2003 Cook was one of the government’s chief opponents of military action against Iraq, and on 17 March 2003 he resigned from the Cabinet. “The truth is, there is no Islamic army or terrorist group called Al-Qaeda, and any informed intelligence officer knows this. But, there is a propaganda campaign to make the public believe in the presence of an intensified entity representing the ‘devil’ only in order to drive TV watchers to accept a unified international leadership for a war against terrorism. The country behind this propaganda is the United States.” – Former British Foreign Secretary, Robin Cook. Robin Cook mysteriously died 4 weeks after giving this statement. The group known as ISIS which is creating terror in The Middle East is a creation of the U.S.A and Israel with support from Britain, France, Saudi Arabia, Qatar and Turkey. Just as America and the CIA was behind the creation of the Mujahedeen fighters to take on the Russians in Afghanistan in the 1980s. For many alternative news readers this is all very obvious, but the large majority of people in the world still have no idea who is really behind the rise of ISIS. Iraq’s Vice President Nouri al-Maliki is now saying what many “conspiracy theorists” and alternative news outlets have been saying for some time now. The U.S. and its allies helped create ISIS (otherwise known as Islamic State, ISIL or Daesh), while Saudi Arabia and other gulf emirates bankrolled the militant group. The multiple names by which the group is known is simply a ploy to confuse serious investigators. While Iraq’s vice president acknowledged that the U.S. had assisted in recapturing Mosul, he also noted that it had contributed to the emergence of ISIS in the first place. “IS resembles the Taliban which was created by the US administration to counter the USSR in Afghanistan. The same way, IS was created to counter the Iraqi stance, which did not agree to blockade Syria, was against no-fly zones in Syria and against American military bases,” he stated. ‘’I’m going to tell you something. I was in England two years before the violence in Syria on other business. I met with top British officials, who confessed to me that they were preparing something in Syria. This was in Britain not in America. Britain was organizing an invasion of rebels into Syria. They even asked me, although I was no longer minister for foreign affairs, if I would like to participate. Naturally, I refused, I said I’m French, that doesn’t interest me.’’ ‘’This operation goes way back. It was prepared, preconceived and planned… in the region it is important to know that this Syrian regime has a very anti-Israeli stance. Consequently, everything that moves in the region- and I have this from the former Israeli prime minister who told me ‘we’ll try to get on with our neighbours but those who don’t agree with us will be destroyed”. You see the Zionists could not overthrow Gaddafi in Libya and Assad in Syria through people uprisings such has happened in the ‘Arab Spring’ in Tunisia and Egypt. Basically because Gaddafi and Assad were popular leaders in their country and the people had a good standard of living. America and Israel could not attack these countries themselves for no reason unless they wanted to pull of another 9/11 and blame it on Libya and Syria and so the only other option to destroy these countries is to fund and arm a proxy army to do it i.e. ISIS. America and Europe are using ISIS in three ways: to attack its enemies in the Middle East or should I say Israel’s enemies, to serve as a pretext for U.S. military intervention abroad, and at home to foment a manufactured domestic threat. Every terrorist incident gets blamed on Isis which is then used to justify the expansion of invasive domestic surveillance, more troops on the street and laws brought in to watch all off our online activities which of course we are told is to keep us safe but they never do keep us safe because these terror events keep happening. Arabs and Jews generally don’t like each other but we are supposed to believe that these Arab ISIS fighters want only to kill Arabs and they don’t even set foot in Israel. Another point is ISIS are only attacking what Israel classes as its enemies Iraq and Syria. You need to know that ISIS stands for ‘Israel Secret Intelligence Service’. Click on the link were two authors admit that the acronym ISIS = Mossad. If ISIS was a genuine and independent uprising that was not orchestrated by the US and Israel, why would they not try to attack the Zionist Israel regime, which has attacked almost of all of its Muslim neighbours ever since it was created in 1948? Israel has attacked Egypt, Syria and Lebanon, and of course has decimated Palestine. Yet, when ISIS comes on the scene as the bloody and barbaric killers of Islamic terrorism, it finds no fault with Israel and it only wants to attack Muslim countries. This stretches credibility just a little bit. Before Russia militarily entered Syria, the US claims it was “attacking” ISIS, yet Russia was able to do in a few months what the US has been unable to do for years. Why? Is the US military that incompetent, or this is further proof that the US has been funding and supporting ISIS all this time? No matter which name they go by – ISIS, ISIL, IS or Daesh – the group has been deliberately engineered by the US and Israel to achieve certain geopolitical goals. They may be Muslims, and they may be advocating an Islamic State, but they are very much working towards the goals of Zionism and Israel. Mossad and other organizations could be responsible for the terrorist acts falsely attributed to Al Qaeda and ISIS. Those who say they are “Al Qaeda spokesmen” are Israeli actors. Adam Gadahn, pictured above, is the so called Al Qaida spokesperson who released videos of himself preaching Al Qaeda goals and ideology on numerous occasions. The FBI even has him on their most wanted terrorists list. It turns out he is a Jew named Adam Pearlman, from California. Adam's grandfather, Carl Pearlman, was a prominent surgeon and on the Board of Directors of the Anti-Defamation League. Another Jew who as disguised himself as a Muslim to convince the world that Muslims and Al Qaeda are a threat was Joseph Cohen (from a Jewish New York family). He named himself Yousef al-Khattab, and he made the fake radical ‘Islamist’ website called Revolution Muslim. Abu Bakr al-Baghdadi, so-called ”Caliph,” the head of ISIS is, according to sources reputed to originate from Edward Snowden, an actor named Elliot Shimon, a Mossad trained operative. Simon Elliot (Elliot Shimon) aka Al-Baghdadi was born of two Jewish parents and is a Mossad agent. The so-called “Elliot” was recruited by the Israeli Mossad and was trained in espionage and psychological warfare against Arab and Islamic societies. 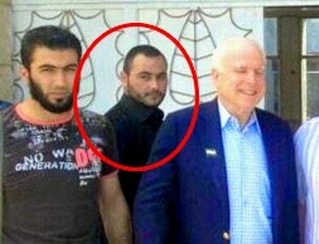 Below photos of Simon Elliot (Elliot Shimon) aka Al-Baghdadi with former U.S presidential candidate John McCain. This information was attributed to Edward Snowden and published by newspapers and other Web sites In 2002 the Palestinian Authorities accused the Israeli Intelligence Service, Mossad of setting up a fake Al Qaeda terrorist cell in Gaza. Palestinian leader Yasser Arafat said Israel had set up the mock cell to justify attacks in Palestinian territory. Funny isn’t it because Mossad did the same thing in America before 9/11, which is setting up fake terrorist cells to be blamed for 9/11. 7 Reasons that ISIS was created by America and Israel. 1. The USA gave ISIS a slick set of matching Toyota pick-up trucks. Yes, the jihadist militant group has been receiving a fleet of Toyota pick-up trucks from the U.S. and Canada. 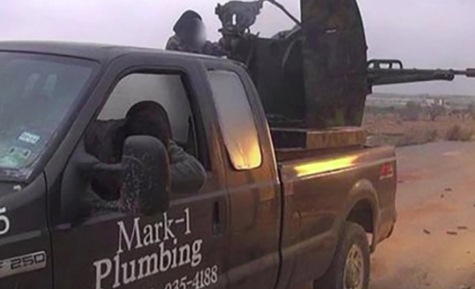 As a matter of fact, a plumber from Texas discovered that his truck is being used by ISIS, with the name of his business still clearly seen labelled on the door. How can a group of militants who supposedly despise anything about the West be so good in spreading their reign of terror online through popular social media platforms? Oh, and the fact that ISIS speak no word of English makes you wonder who handles their publicity online for them. In case you haven’t noticed it yet, the Search for International Terrorist Entities, or simply SITE, seem to always be the first ones to release footages of ISIS’ activities. SITE is founded by an Iraqi-born Jew, Rita Katz, whose father – an Israeli spy, was killed by Iraqis for his intelligence activities. It is always SITE who announces that terror events like Westminster, Manchester and Nice were allegedly done by ISIS. 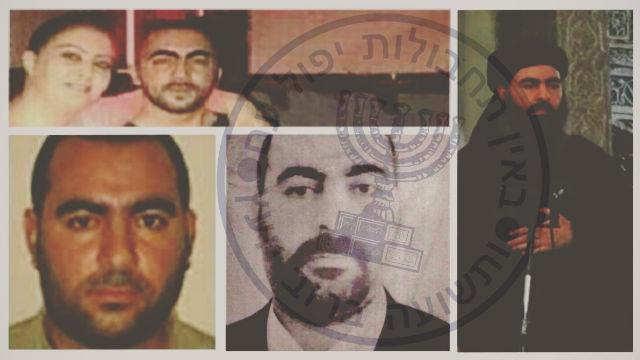 If you’re still not convinced that the ISIS have been wreaking havoc in the Middle East with both the U.S. and Israel as puppet masters, you should know that the jihadist group’s leader, Abu Bakr al-Baghdadi was actually working for Israel’s secret intelligence service as either Simon Elliot or Elliot Shimon. For years, the United States claims that they’ve been engaging ISIS and yet, Russia has been the one to successfully attack the jihadist group more than the Americans have in only a few months’ time, making you question if the U.S. is indeed at war with ISIS or are they just simply incompetent compared to their Russian counterparts. It’s always been said that the United States create wars just to take over a region. They did it with Iraq, they did it with Afghanistan and now, they’re doing it in Syria. You see, the U.S. and Israel have always wanted to take over this middle-eastern region. As a matter of fact, Syria has been trying to fend off foreign meddling from nations like the U.S., Israel, the UK, and France for years. The fact that the ISIS refuse to attack Israel, despite how the Israelis basically decimated their Muslim neighbours like Palestine, Syria, Lebanon, and Egypt, is enough proof that the jihadist group is not really an independent sect that aims to undo the injustice to Muslims but to do whatever it is that both the USA and Israel deem as necessary instead. 1. Salman Abedi and his father were members of a Libyan dissident group — the Libyan Islamic Fighting Group (LIFG) — covertly supported by the UK to assassinate Qadafi in 1996. At this time, the LIFG was an affiliate of Osama Bin Laden's al-Qaeda and LIFG leaders had various connections to this terror network. 2. Members of the LIFG were facilitated by the British 'security services' to travel to Libya to fight Qadafi in 2011. Both Salman Abedi and his father, Ramadan, were among those who travelled to fight at this time (although there is no evidence that their travel was personally facilitated or encouraged by the security services). 3. A large number of LIFG fighters in Libya in 2011 had earlier fought alongside the Islamic State of Iraq — the al-Qaeda entity which later established a presence in Syria and became the Islamic State of Iraq and Syria (ISIS). These fighters were among those recruited into the British-backed anti-Qadafi rebellion. 4. UK covert action in Libya in 2011 included approval of and support to Qatar's arming and backing of opposition forces, which included support to hardline Islamist groups; this fuelled jihadism in Libya. 5. One of the groups armed/supported by Qatar in 2011 was the February 17th Martyrs Brigade which, some reports suggest, was the organisation which Ramadan Abedi joined in 2011 to fight Qadafi. 6. Qatar's arms supplies to Libya in 2011 also found their way to Islamist fighters in Syria, including groups affiliated with al-Qaeda and ISIS. In Libya, US and UK led intervention destroyed the functioning state and created a vacuum allowing hardline Islamist fighters to consolidate their foothold in the country. This paved the way for the empowerment of ISIS. The direct line between Libyan and Syrian Islamist rebels fuelled jihadism in both countries. In Iraq, US and UK led intervention also destroyed the existing state infrastructure and fuelled an Islamist insurgency which incubated al-Qaeda in Iraq and culminated in the emergence of ISIS. In Syria, US and UK covert action, again in partnership with Gulf states such as Qatar, and Turkey, has had the effect of augmenting the role of al-Qaeda in the rebel movement. This combination of Anglo-American policies across the region has contributed to further instability and the rise of violent jihadism. In fact, an even stronger conclusion may be warranted based on the evidence of the extent of UK covert and overt action in the region in alliance with states consistently supplying arms to terrorist groups: that agencies of the British government itself have, in some senses, become part of the broader 'terrorist network' with which the British public is now confronted. While a number of factors operate to contribute to an individual's radicalisation, it is difficult to avoid the conclusion that one of these contributory factors is British direct and covert action in Iraq, Libya and Syria. Without these actions — by Britain and its close allies — it is conceivable that Abedi might well not have had the opportunity to become radicalised in the way he did. The full document Britains Connection to ISIS can be found at Sott.net below.